I am so delighted to be participating in The Secret Recipe Club this month. It is so exciting, kind of like Christmas. This is how it works... A name is 'drawn' and assigned to you. "You simply choose any recipe from the blog you are assigned, make or bake it, and blog about it on the date specified..."
I drew Cooking with Chopin, Living with Elmo. Before I even made it to the blog, I laughed out loud. Not that the blog title is particularly "laugh out loud" funny, but in that I have Elmo sitting next to me at the kitchen table with a toy baby bottle shoved in his mouth (apparently having a 2 year old results in Elmo-sitting while she is off in her Munchkin playland with Daddy). So, I clicked on the link and browsed around the blog. Ginny is a stay at home mom who shares her faith and passion for Jesus, her 2 boys, and husband along with a lust for life, cooking and Frederic Chopin's music through her blog posts. Her blog really drew me in. Although you are more likely to hear Bon Jovi or Daughtry streaming from my kitchen, I can totally relate. I am very excited to have 'found' this blog again. I remember seeing it back before Halloween. I ran across her Ferrero Rocher Brownie Bites with Caramel-Cream Cheese Icing. I promptly followed her blog, and then lost i. So, immediately I knew what I was making. Certainly my favorite little Ferrero Rocher candies (we affectionately call them Ferrari's) would be the perfect SRC post. Well, although I am not surprised, I can't seem to keep a box of those in the house. They are just not safe. You would think that Mr. W or my Munchkin also had an affinity for Ferrari's, but I must confess it is me. I eat them on the way home from the store and grab one here or there while on the phone. Then the next thing you know.... No Ferrari's. Go figure. So, I searched even further. I had just purchased 2 cases of Comice Pears and Pear Cobbler sounded amazing! But, the pears should be very ripe and mine are not ready. So, I bookmarked that one for next week and searched further. I found incredible breads, desserts, healthy things to eat and so so much more. I finally decided on this Lemon Pound Cake with Lavender Lemon Icing. After a heartfelt story about her grandma, with tears streaming down my face and my heart aching for my Grandma, I read over this cake recipe and the lemons drew me in. Having just juiced and zested over 100 lemons from our prolific lemon tree, and having 3 Tuscan Blue Rosemary bushes ready to be planted in the garden, this was the perfect recipe for me. I really hope you enjoy it as much as we did! The lemon and rosemary flavors really come through in this cake! It is divine!!! Preheat oven to 325 degrees. Prepare 2 loaf pans with butter and flour. 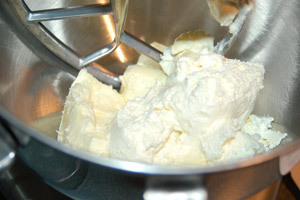 Cream butter and cream cheese together until smooth. Gradually add sugar - about 1 cup at a time, beating well (on medium speed) after each addition. Add vanilla, lemon zest and rosemary, beat until incorporated Alternately add eggs and flour, beginning and ending with flour. Place in the center of the oven and bake for one hour and 15 minutes or until a wooden toothpick inserted in the center comes out clean. Cool in pan for 10 minutes. Remove from pan and let cool on wire rack, upside down. 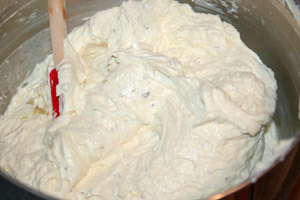 Mix together all ingredients except the milk until a very smooth (but thick) consistency is reached. Add the milk a teaspoon at a time until the desired consistency is reached, adding more milk for a thinner glaze and less for a thicker glaze. 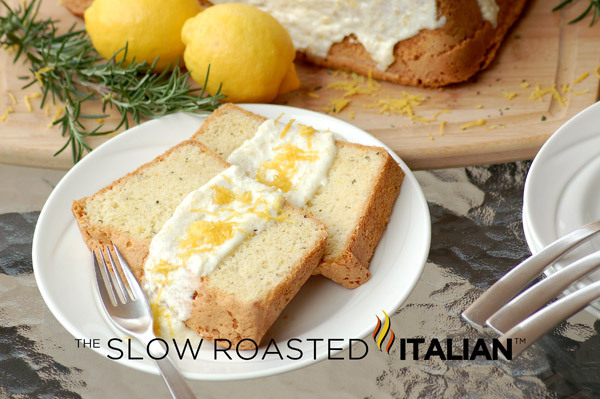 Glaze pound cake, garnish with lemon zest and fresh chopped rosemary (optional) slice, and enjoy! Such a unique combination - sounds intriguing....... You're so blessed to have rosemary AND lemons growing in your own yard!!! I'm a bit jealous! Rosemary and lemon is my go-to duo of flavors for roast chicken, but I've never thought about it in cake---I love this, and I love the concept of the Secret Recipe Club. I adore lemon anything and your poundcake looks amazing. I'm with Sue...rosemary and lemon are a prefect savory pair...so why not for sweets too. What a great pairing of flavors. I have rosemary in my garden; this looks like a good use for it. Yum! 100 lemons! OMG woman. This is an amazing looking pound cake! What a blessing it would be to have lemon trees. Not a one would go to waste around here. I made a delicious lemon drizzle cake you ought to try with all those lemons for last months SRC reveal. You won't be disappointed. mmmm... this must be delicious! What a beautiful cake! I'll bet it was outstanding. I'm going to have to bookmark this one. Oh, and Pear Cobbler sounds just as good. What a great SRC choice. Oh my gosh, this must have tasted so good! This sounds heavenly! Love the rosemary and lemon mix!! I'm pretty sure I would devour this pound cake in one sitting. All my favorite flavors in one baked good? Lord have mercy. I'm betting that I would adore the lemon and rosemary together, it sounds amazing.